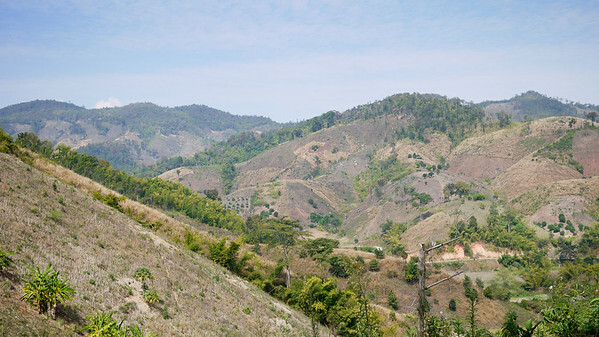 Views of the hillsides on the journey to the Akha Ama coffee village near Chiang Mai, Thailand. 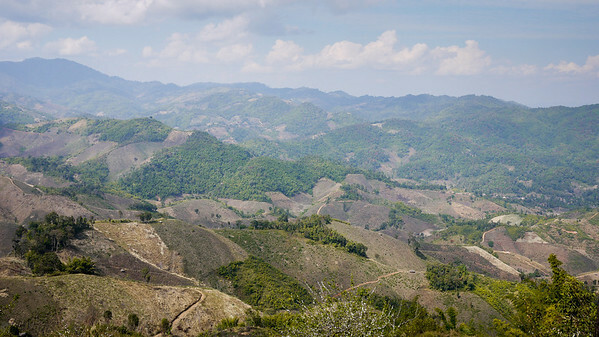 Panoramic views from the back of the pickup truk heading to Akha Ama coffee village near Chiang Mai, Thailand. 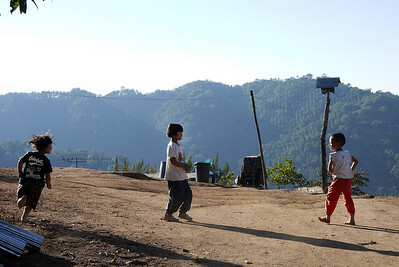 Excited kids run behind the truck when we arrive at the Akha Ama coffee village near Chiang Mai, Thailand. 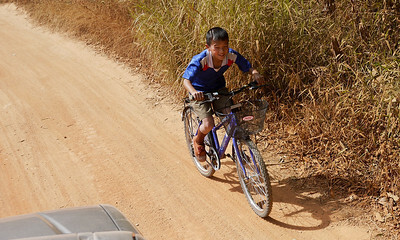 Children biking alongside the pickup truck heading to Akha Ama coffee village near Chiang Mai, Thailand. 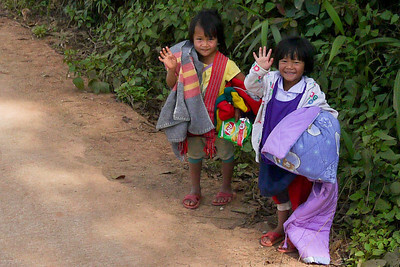 Sweet children smile and wave as we pass by on the way to the Akha Ama coffee village near Chiang Mai, Thailand. Switching from a songthaew to a pickup truck fro the journey up the mountain to the Akha Ama coffee village near Chiang Mai, Thailand. 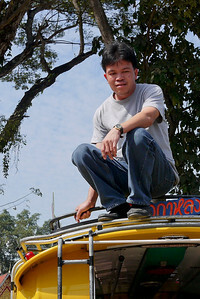 Packing up the songthaew for the ride to the Akha Ama coffee village near Chiang Mai, Thailand. 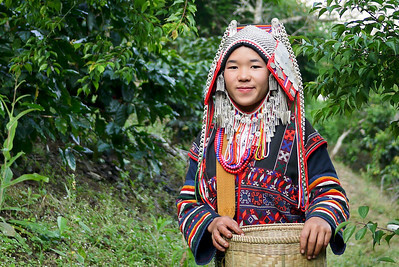 Akha Ama coffee village near Chiang Mai, Thailand. 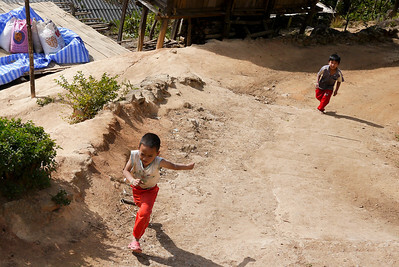 Children play in the dusk at the Akha Ama coffee village near Chiang Mai, Thailand. The sweet faces of children in the Akha Ama coffee village near Chiang Mai, Thailand. 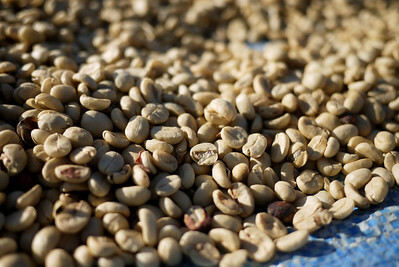 Coffee beans drying in the sunlight at the Akha Ama coffee village near Chiang Mai, Thailand. 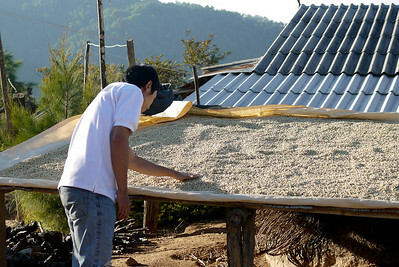 Drying coffee at the Akha Ama coffee village near Chiang Mai, Thailand. 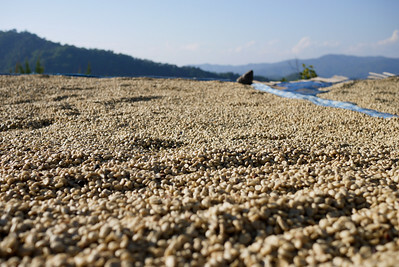 Mountain-grown coffee beans laid out to dry, Akha Ama coffee village near Chiang Mai, Thailand. 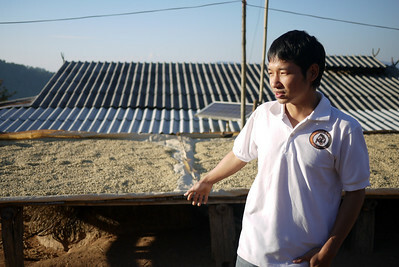 Lee explains the journey to becoming fair-trade and organic coffee at the Akha Ama coffee village near Chiang Mai, Thailand. 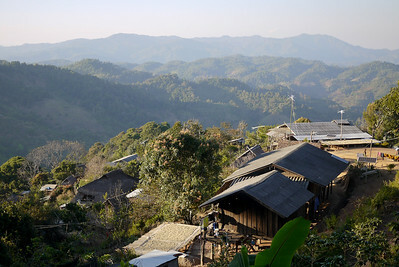 The small Akha Ama coffee village in the mountains near Chiang Mai, Thailand. 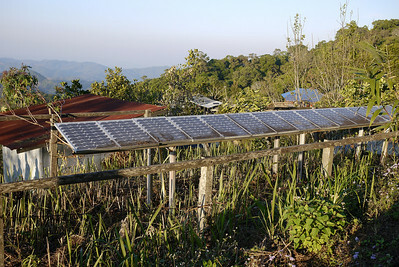 Solar panels keep the village in power at the Akha Ama coffee village near Chiang Mai, Thailand. 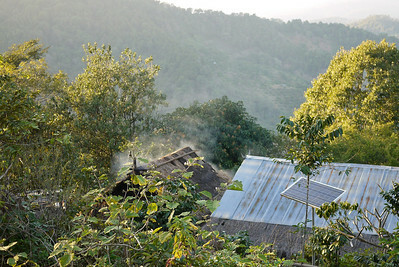 A house with disused solar panels in the Akha Ama coffee village near Chiang Mai, Thailand. 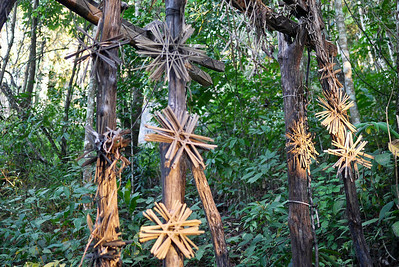 The sacred entrance to the Lee's village, a village-wide ritual is held annually to replace the adornments protecting the village and its inhabitants from negative spirits. 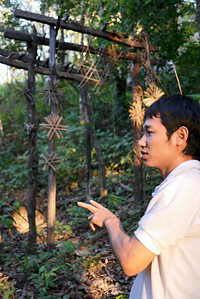 Lee explains the customs and beliefs of the Akha people in a coffee village near Chiang Mai, Thailand. 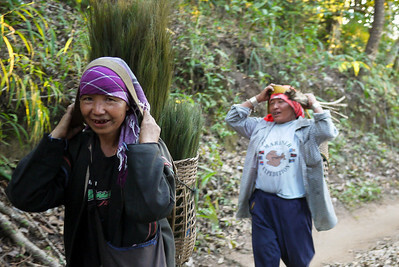 Worked return from the fields, Akha Ama coffee village near Chiang Mai, Thailand. 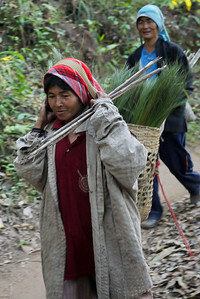 Woman returning from a day at work, Akha Ama coffee village near Chiang Mai, Thailand. 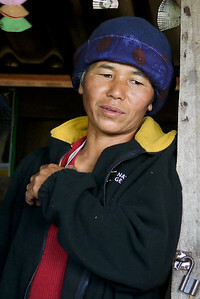 Villager displays the traditional Akha clothing in a coffee village near Chiang Mai, Thailand. 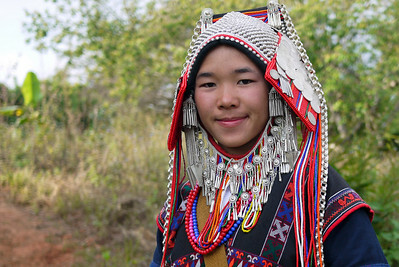 Traditional Akha clothing from a coffee journey to a village near Chiang Mai, Thailand. 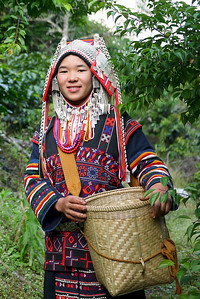 A beautiful traditional Akha villager showing us their traditional clothing at a coffee village near Chiang Mai, Thailand.